SpaceX's Dragon spacecraft and Falcon 9 rocket are seen in the horizontal position ahead of a planned Jan. 10, 2015 launch from Cape Canaveral Air Force Station in Florida. Mother Nature appears to be cooperating for the planned launch Saturday (Jan. 10) of SpaceX's next robotic cargo mission to the International Space Station, a liftoff that will also include a potentially epic demonstration of reusable rocket technology. Weather forecasters are predicting an 80 percent chance of good conditions Saturday morning at Florida's Cape Canaveral Air Force Station. 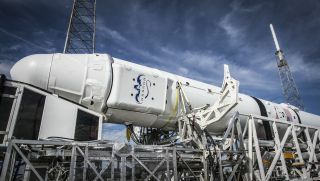 SpaceX's Falcon 9 rocket is scheduled to launch the company's unmanned Dragon capsule from the Cape at 4:47 a.m. EST (0947 GMT) Saturday; you can watch the SpaceX launch live on Space.com beginning at 3:30 a.m. EST (0830 GMT), courtesy of NASA TV. The bold and unprecedented maneuver is part of SpaceX's ongoing effort to develop fully and rapidly reusable rockets, which the company's billionaire founder, Elon Musk, has said could slash the cost of spaceflight by a factor of 100. Musk gave the rocket-landing attempt just a 50 percent chance of success. But he has also stressed that, whatever the outcome Saturday, the company will keep working until it's able to set a rocket down softly on land and then refly it. Dragon is packed with more than 5,000 lbs. (2,270 kilograms) of food, spare parts and scientific hardware on this cargo mission, the fifth of 12 that SpaceX plans to fly to the orbiting lab for NASA under a $1.6 billion contract. One of the scientific experiments, NASA's Cloud-Aerosol Transport System (CATS) instrument, will eventually be mounted to the exterior of the space station. Once up and running, CATS will use a laser to study clouds and tiny particles of dust, smoke and pollution in Earth's atmosphere, with the aim of helping researchers better understand the effects of climate change. If all goes according to plan, Dragon will arrive at the space station early Monday morning (Jan. 12); astronauts will then grapple Dragon using the space station's huge robotic arm. The capsule will stay berthed to the station for one month, then depart for a soft splashdown in the Pacific Ocean off the California coast, where SpaceX will retrieve Dragon by boat. Saturday's launch was originally scheduled for Tuesday (Jan. 6), but an issue with an actuator on the Falcon 9's second stage pushed things back a few days.